The fine art of converting healthy persons into patients . Common sense would indicate medical care is meant for the sick and ill . Relieving the mankind from all those suffering with a healing hand has made the medical profession noble and sacred .Medical science grew with this sole aim many centuries ago .Some times we succeeded and many times we failed and the journey is continuing . In those days ,scientists were dedicated , inventions were genuine and were driven by a need to conquer a diseases .Some where along the line, (May be in the last 2-3 decades?) our quest for money power exceeded commonsense . Commerce entered every walk of life and medical science became the biggest causality. The purpose of noble profession was forgotten . Simultaneously public awareness and quality if life vastly improved in many of the developed countries . So the traditional illnesses either disappeared or reduced to a great extent . Then came the life style diseases.The cost of treating an illness spiraled too much especially in the scientifically advanced countries . What was perceived as great health care system became the most ridiculed health system in the planet ? In the name of science and modernity , medical treatment was glorified beyond the level it deserves , and hence the cost of treatment is kept at artificially & foolishly high (This often involves diagnostic exploration of human body with modern gadgets without any meaningful purpose ) . ie , In a nutshell of modern medicine is often a medical mirage than a miracle . We know , the chances of success as we try to chase it. If we think the world is waking on this issue . more and more countries just imitate the failed ( Scientific and moral failure ) western models of health care . When major illness are reducing in a society what will the health care providers do ? Feel happy ? Yes that’s what a sane mind would do . In a capital rich , health conscious , knowledge driven society the opposite happens . When the patient input into a top hospital reduces , the MBAs in them plan strategies to bring increase the bed occupancy rate and maintain patient parity. If sufficient patients are not there in a community what shall we do ? Creating new patients is a too dangerous game , what shall we do ? In the name of preventive screening let us label normal persons as patients . The following examples are personal observation made in huge city of educated elite in a developing country . Excuse me if it offends a few . . .
Make, 130/85mmhg of blood pressure as pre hypertension and make them visit our HT clinic every month. Let us label all the age related bone loss as deadly osteoporosis and do bone graft. Let us call the occasional post dinner stiff stomach as non ulcer dyspepsia and insert a endoscope into the patient tummy . Do a 64slice CT in a master health check and convert many of the healthy normals into carriers soft coronary plaques. Do a ultra sound scan in every one who takes alcohol and give our brains a temptation to label the normal fatty streaks as infiltrative fat disorder . Do routine pelvic scan and detect sub clinical fibroid uterus as potentially malignant and post them for hysterectomy on the next operation day. Convert all healthy women as a potential cervical cancer and administer herpes vaccine and help the vaccine company share move up in wall street ! Finally , screen all our playful kids for learning disability and label them as slow attention deficit disorder and make their life permanently miserable . While the above misadventure with scientific excesses goes on merrily , lest we forget , millions of children and adults suffer in misery for want of live saving investigations and drugs in any country . When a person with a head injury dies due a missed subdural hematoma for want of CT scan in one hospital , ” in the adjacent hospital” a wealthy and healthy man ( who got admitted for master health check up ) undergoes a series of scans all over the body even as he is watching the satellite TV in the comfort of a five star suite ! Finally ending with a very positive note ! The new initiative by Obama , ” Health care for the uninsured ” is to be welcomed as great move and will do a world of good . But , our only request to WHO ( or related bodies ) is to create a forum or authority to impeach all fancy diseases from the medical literature ! 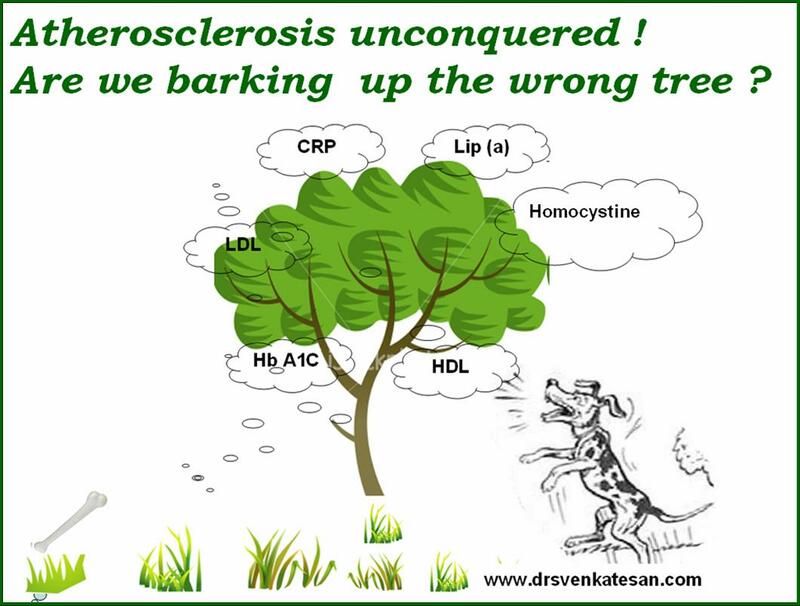 Conquering atherosclerosis : Why we are not getting the desired outcome ? Atherosclerosis remains the number one cause for all vascular disease of human beings. It probably kills more patients than all other causes put together . Modern medicine has never conquered the disease. How the vascular system ages and why some develop premature atherosclerosis remains largely speculative. While it is true , we have identified some major risk factor for development and progression of the atherosclerosis , patients with out any of those risk factors do develop severe atherosclerosis !So researchers sought to look for some other risk factors . There lies the difficulty and irony . We always tend to the research with the affected population .When we know millions of people with the so called risk factors live comfortably , there lies an opportunity to analyse why they are protected against the onslaught of atherosclerosis .It is always convenient to blame it or bless it on the genetic predisposition .But we need to look beyond that .Of course . every genetic expression has to manifest phenotypically . While the search for all those hidden secrets has to continue , we should also realize in pursuit of breakthrough we some times waste our energy in false targets for too many decades ! While our basic science colleagues struggle in molecular factories and biological models in pursuit of answer against atherosclerosis , our elite cardiac physicians carry on with the cosmetic touches over this progressive disease in sophisticated cath labs. Let us hope man prevails over nature . . .
A cartoon , Just for laughs . . .
Who is an “Interventional cardiologist” ? Is he a person who puts a metal coil coated with a synthetic fungus in a incidentally detected block inside a small coronary artery and sends the bill to the Insurance company ? Is he a person in a cosmopolitan hospital who opens up a chronically closed coronary artery , in an asymptomatic patient and live telecasts his achievement trans continentally ? Is he a person who checks in by the early morning flight and puts multiple wires in an aged patient with class 3 heart failure and make him walk 20 meters extra at a cost of 1000$ / Meter ? Is he the unknown physician who Intervenes in the natural history of Rheumatic heart disease and arrests immune mediated valve damage by giving the monthly injections penicillin in remote parts of our country ? Is he the person who Intervenes to prevent young persons from smoking and help maintain their coronary endothelium enriched with nitric oxide & arrest the coronary epidemic ? Is he the small town doctor who Intervenes to treat a breathless cardiac failure patient with digoxin and frusemide and dramatically alleviate the symptoms and prolong the life of our poor country men? Is she the village health nurse from an inaccessible health centre located in a hilly terrain , Intervening successfully, by pulling out live babies from severely anemic pregnant mothers with failing hearts ?